Mission Statement - ISM: Industrial Steel & Manufacturing Inc.
ISM promotes a work environment, in all operations, free of discrimination or harassment. 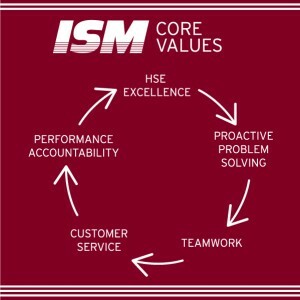 ISM demonstrates the highest level of ethical standards. ISM displays HSE (Health, Safety, and Environment) Excellence in all operations. ISM team members are equally responsible for HSE excellence, profitability, and overall long-term success in all operations. ISM and its Team Members are proud stewards in the community. ISM is proud of its Aboriginal heritage and continually participates in positive Aboriginal relations. ISM supports our industry partners through numerous professional memberships, associations, and affiliations across Canada. ISM is a consistently profitable firm. ISM is an equal opportunity employer. ISM promotes a healthy lifestyle. ISM promotes work – life balance.